The Cathedral Choir can trace its origins to the consecration of the Cathedral in 1868 and this establishes this group as one of the oldest continuously active choirs in Australia. The choir comprises boy choristers and choral scholars from St Andrew's Cathedral School, as well as a group of gentlemen, known as lay clerks who sing the lower parts. 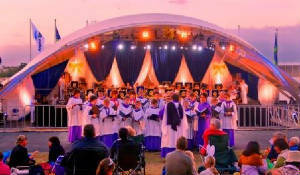 Through overseas tours and recordings St Andrew's Cathedral Choir has won an international reputation and has accepted invitations to deputise for the resident choirs in such places as St Paul's Cathedral London, Canterbury & York and many other important centres of Anglican worship. In 2002 the choristers appeared before H.M. the Queen at a Golden Jubilee concert in St George's Chapel Windsor Castle and also made a significant contribution to the ANZAC day service in Westminster Abbey. On March, 13th 2006 the cathedral choir sang in a major service in observance of Commonwealth Day in the presence of Her Majesty, The Queen and His Royal Highness, The Duke of Edinburgh at the Cathedral. 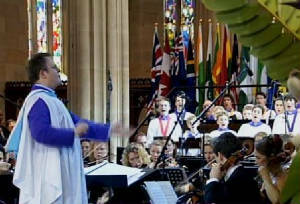 The service was broadcast live across Australia. The choir has made several recordings and the latest CDs, Fairest Lord Jesus and Choral Evensong are available for purchase in the Cathedral bookshop, and online by contacting the webmaster. The latter was produced from a service broadcast throughout Britain on BBC Radio 3 at the time of the Sydney Olympics. During the school terms the choir sings at the morning Sunday service at 10.30am and at Evensong on Thursdays at 5.30pm. The choristers also sing a service of Morning Prayer each Wednesday at 8.00am, to which all are warmly invited to attend. From 1981-2005, the Choir was under the direction of (now Rev.) Michael Deasey, and he was suceeded by a new Master of Choristers and Director of Music from England, who took up his postion on the 28th November 2005. He is Ross Cobb, formerly Director of Music at Christ Church Clifton in Bristol. The Director of Music is always eager to talk to parents of boys about the possibility of their sons joining the Cathedral Choir, and the Cathedral School. In addition to the extraordinary musical, educational, social & personal benefits that choristers receive, they are also given a very generous reduction in fees from St Andrew's Cathedral School. Please don't hesitate to contact him on [+61] (2)92651674, or by e-mail by clicking on the link below. For a great site detailing the history of the Cathedral's Organs & Organists-click on the title below. The site includes technical details, photos & specifications of the instruments.